Women's Wooden Inlay Titanium Wedding Ring : LOVE2HAVE in the UK! 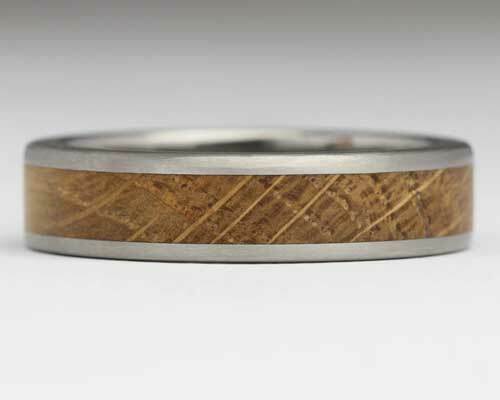 A titanium wedding ring with a wooden inlay for women. This ring measures 6mm in width and comes inlaid with oak that measures 4mm wide. We have chosen oak as it is known to be a very durable type of wood, and therefore compliments the strength of titanium. The ring has a flat profile, and the titanium has a satin matte finish. The fitting of it is a comfort one, meaning it is slightly curved and glides nicely onto the finger. We sell other widths of this ring also but list this one at 6mm, a nice width for a woman's finger.